Ahmer, Kaushik, Thompson, Nargus, Jake, Reuben and Ramesh from the Sydney West Surgical Skills Network. Western Sydney Local Health District surgeons have taken out the top spot for the second year in the row at the Health and Education Training Network’s seventh Golden Scalpel Games. The Games provide a unique opportunity for the next generation of surgeons to showcase their talents in a team-based competition. Senior Resident Medical Officer Dr Ramesh De Silva from the Sydney West Surgical Skills Network said he enjoyed a great day. “The games promote surgical development among pre-vocational trainees,” Dr De Silva said. Meet your Western Sydney Local Health District Golden Scalpel Games champions. Ramesh said the stations were timed for twenty minutes, with teams rotating through stations. Each station was marked by surgeons and surgical trainees with a running score displayed on a projector that ranked teams throughout the day. “It was a great day. It’s a fantastic opportunity for junior trainees to develop their surgical skills and gain surgical mentors who can train us. Team selfie captures the fun on the day. Associate Professor Kerin Fielding – the first female orthopaedic surgeon in NSW and Chair of the Clinical Surgical Training Council – opened the Games and supervised on the day. Professor Fielding says the Games reinforce the importance of surgical skills training to build confidence, reduce risk and improve knowledge and safe patient care. “HETI’s Golden Scalpel Games give aspiring surgeons from the state’s six Surgical Skills Training Networks based in regional and metro areas a wonderful opportunity to gain experience and knowledge from their peers and senior medical professionals,” Professor Fielding said. “This year, for the first time the Golden Scalpel Games featured a team of young indigenous medical students vying for the top prize,” added Professor Fielding. Western Sydney Local Health District’s surgical skills training network manager Linda Bell congratulated the team on their success. 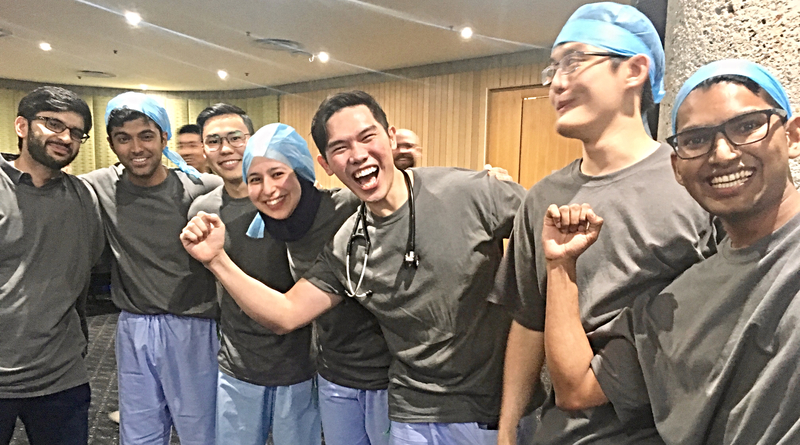 “A special thanks to all of the consultants and mentors who also helped with the team training – Dr Ahmer Hameed, Dr Michael Su, Professor Henry Pless, Dr Jeremy Hsu, Dr Alex Varey, Dr Jong Woo, Dr Alex Brown and Dr Thomas Oh,” Linda said. “I’m very proud of the commitment, professionalism and comradery shown by our team members.